We traveled to China! Until now I can’t believe that we have been to Xi’an, one of the most important cities in China. This last minute trip turned to be an awesome experience and a great initiation to Chinese culture and history. After a few days of fun, here is a list of the top 10 things to do in Xi’an. This year we crossed off so many destinations from our travel bucket list, from traveling to the Komodo Islands in Indonesia, to Macau, Hong Kong, and Xi’an in China. No doubt Xi’an was the biggest surprise. I thought that our trip Shaanxi Province, northwest China, was going to be only about museums and historical sites, but actually was full of adventure, adrenaline, and fun. So, if you are planning to travel to China, these are the 10 amazing things to do Xi’an that you must add to your travel itinerary. From natural wonders to mouthwatering meals. 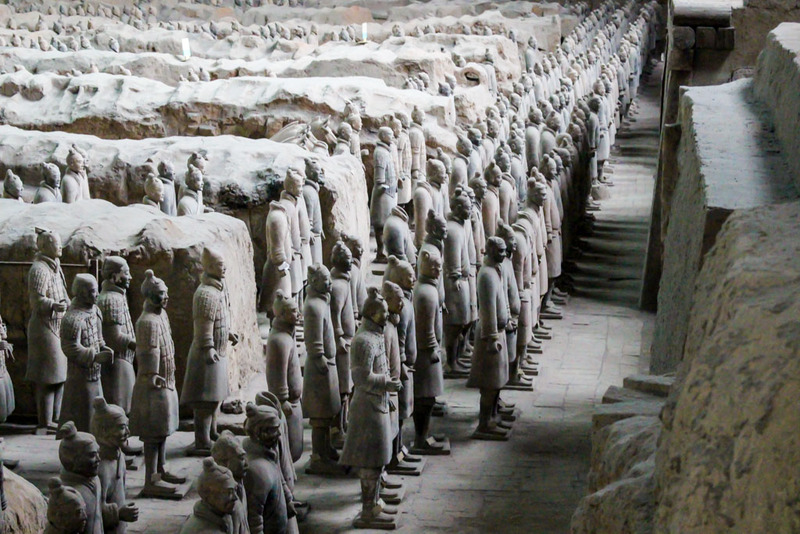 The Terracotta Warriors are the most famous attraction in Xi’an and you must see them. Visiting the Mausoleum of Qin Shi Huang and walk by the huge pit are an extraordinary experience. The warriors are impressive, the size, the expressions, the perfect craft work. Everything is mind blowing, especially if you starting putting the pieces together and realize that the Terracotta Warriors date back from 221 B.C. The Museum is packed, and you gonna spend at least 3 hours walking around. But the visit is totally worth it, this is such a unique thing to do in Xi’an. If you have spare time, visit one of the workshops around the museum and have a close look on how the warriors are made. 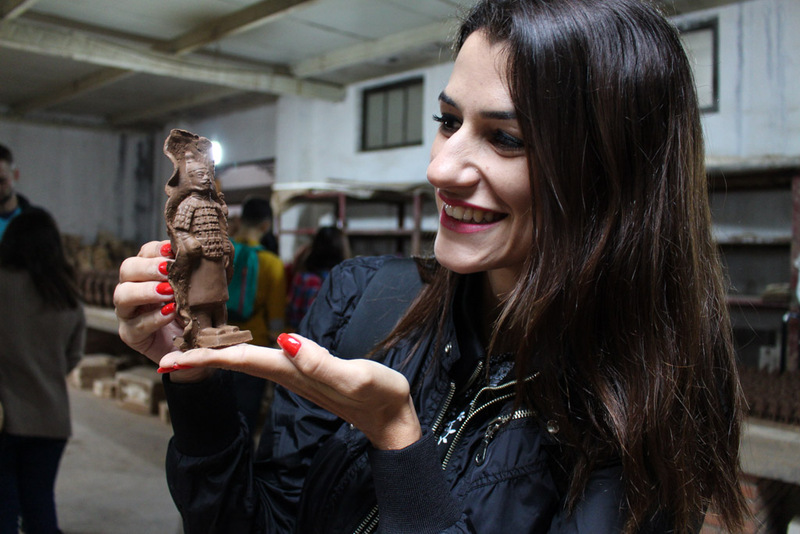 Or even better, you can make one of them, put your hands in some local clay and create your first ever terracotta warrior. Be prepared for adrenaline, heights and sweat. 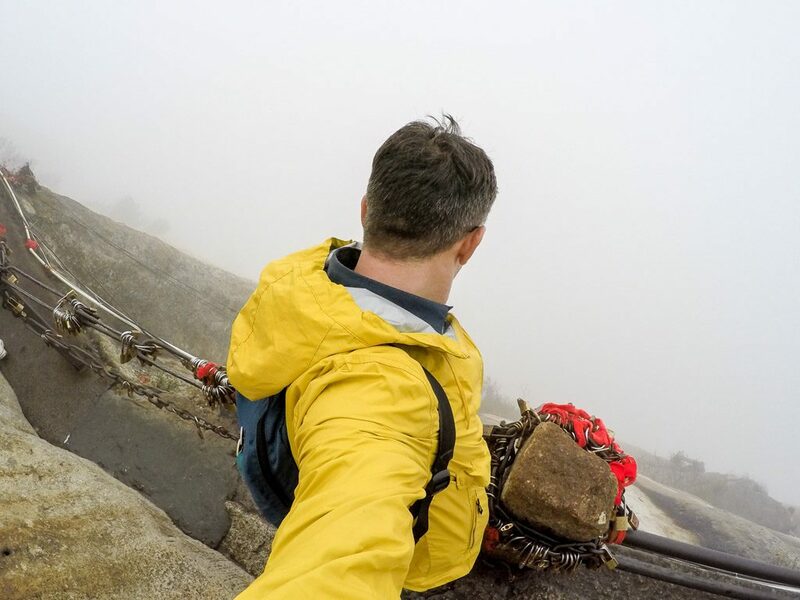 Huashan mountain is not only one of the most beautiful places to visit in Xi’an, it’s also one of the most challenging things to do in Xi’an. Climb Mt. Huashan is not easy, but is doable, a day trip to the mountain is a must and you will be swept away by the natural beauty of this place. 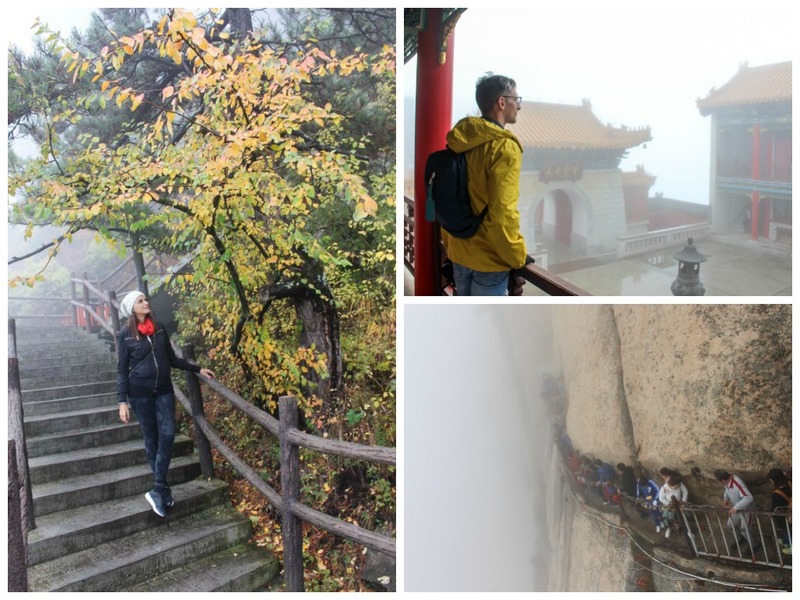 Known as one of the most dangerous hikes in China, Mt. Huashan have 5 peaks and the highest one is the South Peak 2,154.9 meters above sea level. It’s a long journey to the top, first you need to buy the ticket at the tourist center, then you take a bus to the main entrance of the mountain and from there you go on a cable car to the top of the mountain where you can walk to the peak. They say it’s a very scenic route and I bet it is, although we couldn’t see anything apart from clouds and mist. The old town of Xi’an is surrounded by a huge wall, an impressive and well-preserved construction. The wall is open to the public, you just need to buy the ticket and go on the top of it. 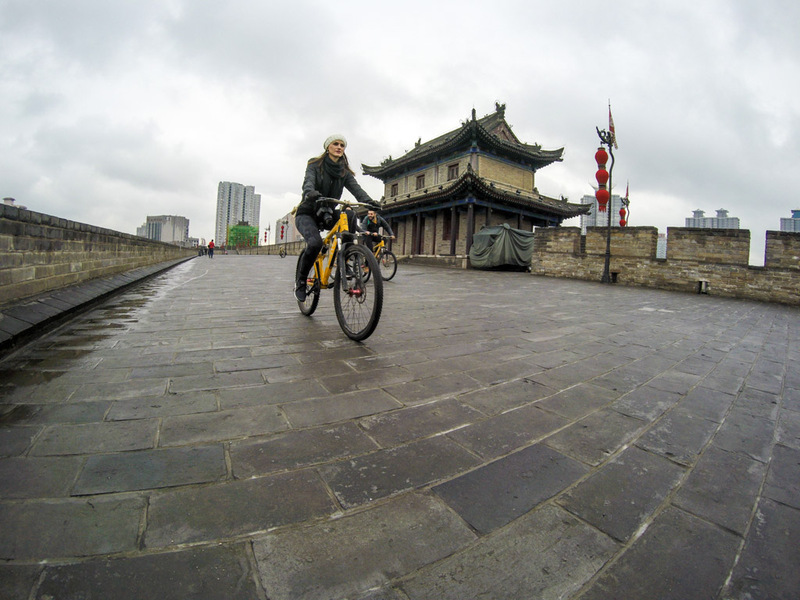 But things can get better, one of the amazing things to do in Xi’an is to ride a bicycle on the top of the wall. You can discover the history behind the Ming and Tang dynasties while cycling and having fun. Go on an artistic journey at the Tang Bo Art Museum and learn about Chinese painting and calligraphy. Appreciate ancient and modern art and try your talent in a hands-on workshop. This was one of my favorites things to do in Xi’an, so rich in culture, information, and great fun. When the “teacher” was presenting the symbols and the technique everything looked so easy, but once you hold the brush and you start writing the first Chinese words you realize how artistic the Chinese calligraphy is, and how difficult is to master it. I spent minutes trying only one word, and the result of awful. I couldn’t write the proper word but on the photo, I look like a professional. The Shaanxi History Museum is huge, and if you really want to appreciate all the art and history inside you must spend a day there. We didn’t have much time, and as much as I like history and museums, I have a time limit for it. I can’t stay longer than 3 hours inside a museum, I get dizzy, I need a drink, food…. Sorry but that’s me! During our quick visit to the museum what we saw was really impressive. Murals from the Emperor’s tombs, painting, artifacts and history from the Silk Road. I forgot to mention before, Xi’an was the starting point of the Silk Road, the route that connected merchants from Europe to the Orient. Not only a business route but a cultural and social achievement in the human history. I like food, but nothing better than eat delicious food while wearing a traditional Chinese costume. The restaurant is stunning, the staff was dressed in costumes that made us travel in time, to the period of Qin Dynasty. We had our own private dining room and Chinese costumes waiting for us. That’s what I call a proper fancy dinner. The food was prepared to perfection, old Chinese recipes served in beautifully decorated plates. In the menu Chinese delicacies as chicken feet, cold spicy noodles, soups, and local wine. After the dinner they let us walk around the restaurant, take photos and act like crazy tourists. The only problem is that we couldn’t keep the robes. 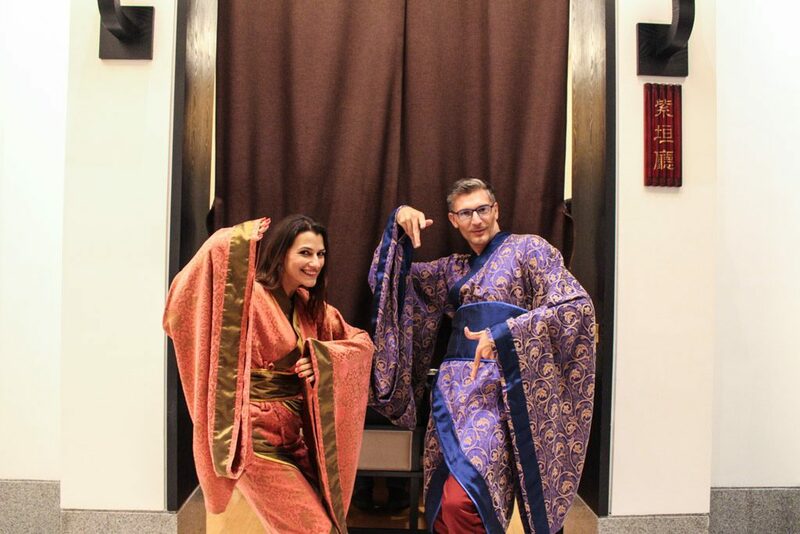 After the dinner, my desire was to be dressed in Chinese clothes for the rest of trip. Even being a historical and important place in China, Xi’an is a modern city. If you really want to see how life was during the Tang Dynasty, then you should visit the Yuanjia Village. When the bus stopped there we had the feeling of traveling to the past. The tiny houses, the cobbled streets, alleys, food being cooked with wood fire and the mist in the air made everything looks so real. The village was built to keep the ancient traditions alive, to show the visitors some crafts and foods that have been forgotten in modern China. The nicest part is that most of the people visiting the village were Chinese, it seemed that Yuanjia Village is more a local tourist attraction that actually a place for foreigners. 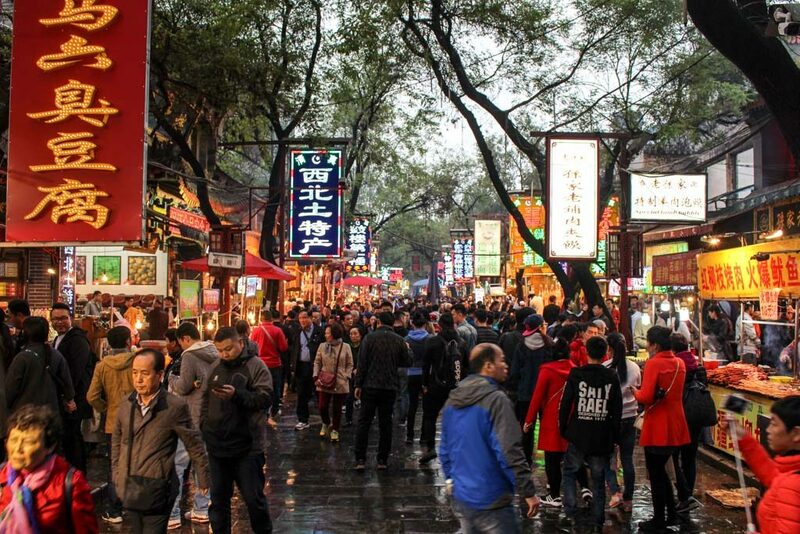 What makes it a super special place to visit in Xi’an. 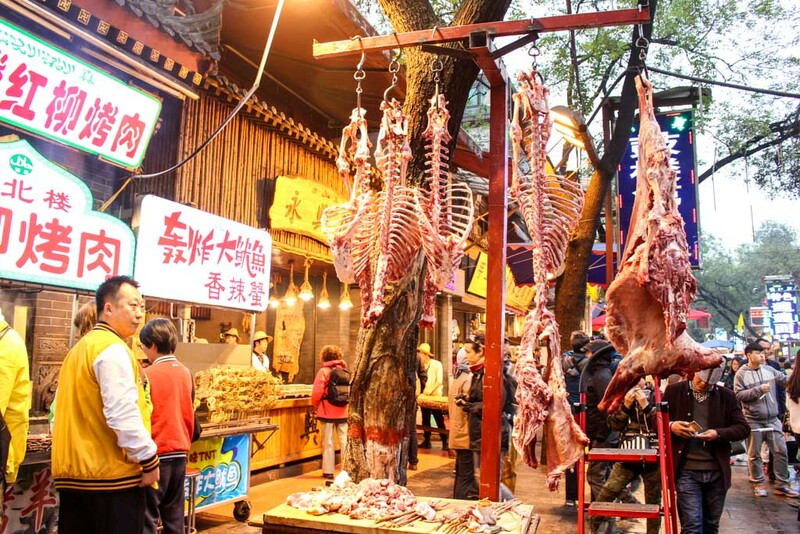 This is one of the most interesting and delicious things to do in Xi’an, and you must spend at least one evening at the Huimin Muslim Quarter in the old town. The Muslim Street is the physical mark of the Silk Road, where everything started and where you can see the Arab influence in the middle of China. 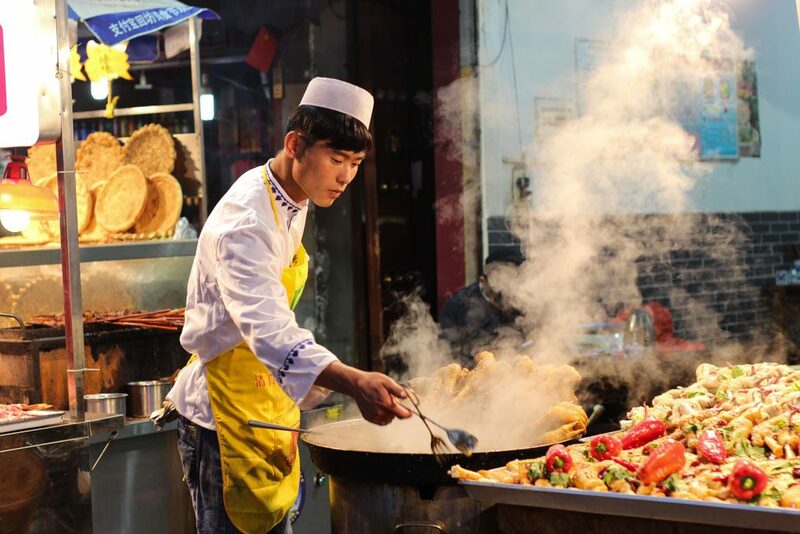 The mix of culture resulted in a delicious and mouthwatering street where you can find local Chinese dishes served with nuts and traditional flavors from the middle east. Go with an empty stomach and eat everything you can… Some dishes look good and taste good, other I’m not that sure… If you like a food adventure, this place is for you. My favorites: the roasted potato with paprika, the grilled and spicy tofu, and the tofu skin with peanut sauce. 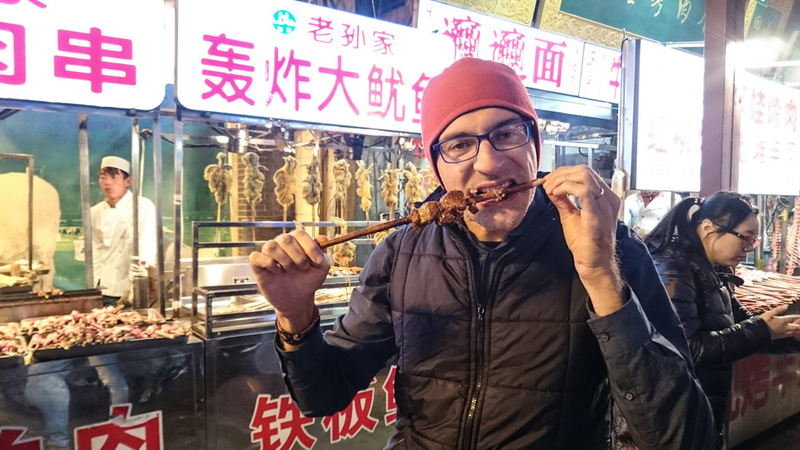 Rob tried the lamb skewers and love them too. Go to the Muslim Quarter for the food, but also pay attention to the little houses, the traditional architecture and the mix of culture. It’s a really interesting place to visit in Xi’an. Before venturing yourself into the Muslim Quarter you must visit the Drum and Bell Tower, that are located close by. Our guide told that every city in China has these two towers, one for the drums and other for the bell. What makes them so special is the architecture and how they look magical after sunset when the colored lights start to shine in the middle of the black night. 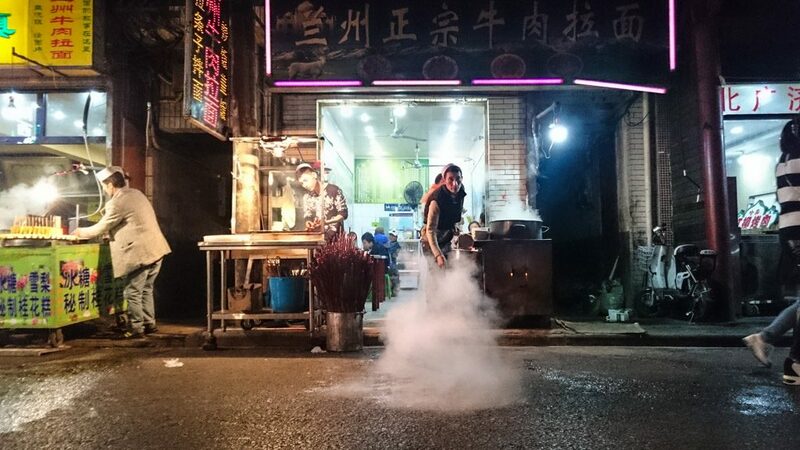 The 10th unmissable thing to do in Xi’an must be eating good food! Gorgeous and yummy vegetarian food! I know you are probably thinking this is a silly joke, but it’s not! It’s true! One of the best meals we had during our whole trip to Xi’an was in a vegetarian restaurant, more precisely a Buddha restaurant. The name of the place is Tian Long Bao Yan and they serve a banquet of flavors, from soup to stir fry veggies and mushroom that taste like heaven. It was great to see how vegetarian food can be creative, tasty and unusual. Now that you already know all the unmissable attractions in Xi’an, it is time to talk about how to plan your trip to Xi’an. Also, check out this great 2-week itinerary in China and enjoy the best of the country. Before you even think about buying your flight to China, first you need to check the visa requirements. Depending on where you are from, your passport or where you are living, you will need to follow some rules and put together some documents. Here is the link to the Chinese Visa information website, have a look and follow the instructions. 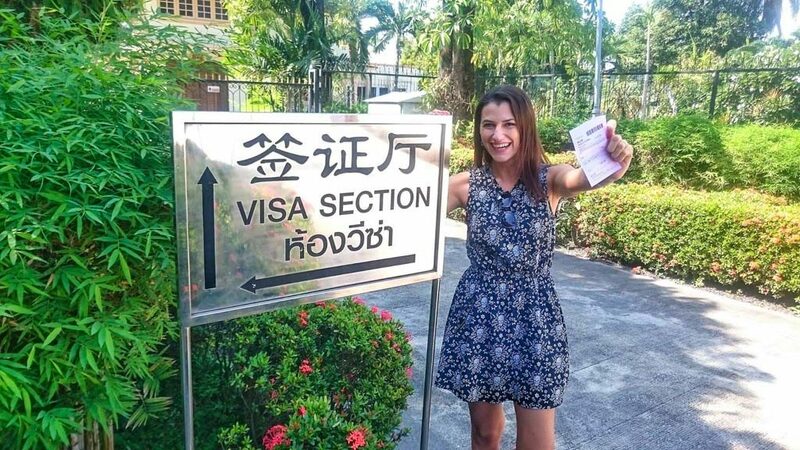 We applied for our visa at the Chinese Embassy in Chiang Mai, Thailand. It was an easy and fast process. As our trip was organized at the last minute, we opted for the 24 hours visa service, it was a bit more expensive than the traditional visa, but we received the Chinese tourist visa in 24 hours. Before flying, make sure you have empty pages on your passport and that you look alike to your passport photo. That was an issue Rob faced while crossing the border. On his passport, he was with a tiny beard, but at the day we traveled he was shaved, also the gray hair flagged him as suspicious. The officer at the immigration wasn’t sure if he was the true owner of the document. Took him almost 15 minutes answering questions till he finally got the stamp. Probably you will need to get two flights to travel to Xi’an. To research and buy long haul flights we use Kiwi. They have a really cool searching system to find the best connections, save money and travel wisely. You can try the public transportation, bus and metro are everywhere in the city. But with the language barrier, it can be a real challenge. Another option is to use Uber, the service works pretty well, you don’t need to explain where are you going and you can pay by credit card. Easy peasy! Never used Uber before? Sign up here and get a free ride, a little gift from Love and Road. We stayed at Sheraton Xi’an and it was a really nice. The hotel is very classic, the rooms are spacious, the bed lovely and the breakfast huge… It took me three mornings to finally discover all the food served during the breakfast, from oriental dishes to the most westernized eggs ‘n’ bacon. The only downside of the hotel is the rules for using the pool. They have a huge warm swimming pool, but to enjoy it you need to wear a swimming cap. So don’t forget to pack yours! Check the rooms and do your reservation at Sheraton Xi’an here, if you are not sure if this is the best hotel in Xi’an for you keep searching. We recommend you to book at Agoda and Booking.com, they have a good selection of properties and good prices. If you are traveling on a budget you can find rooms for 20 to 30 USD dollars, what is a good price for the city. You are traveling to China and there will be some cultural shock, it’s normal. I was a bit concerned with this trip and if I would handle well some of the Chinese behaviors that bother me, but to be honest, overall it was fine. Only the spitting and the super loud talking that annoyed me a bit. But it’s ok, the places we visited were so beautiful, we learned about such interesting culture and history, that the cultural differences are part of the process. If you have problems trying different food, or if you don’t know what to expect from China, do a good research before traveling to Xi’an. Read about the Chinese manners and prepare yourself. Sometimes travel takes you out of your comfort zone, and that’s amazing! Love it?! So Pin it for Later! Are you excited to travel to Xi’an, China? 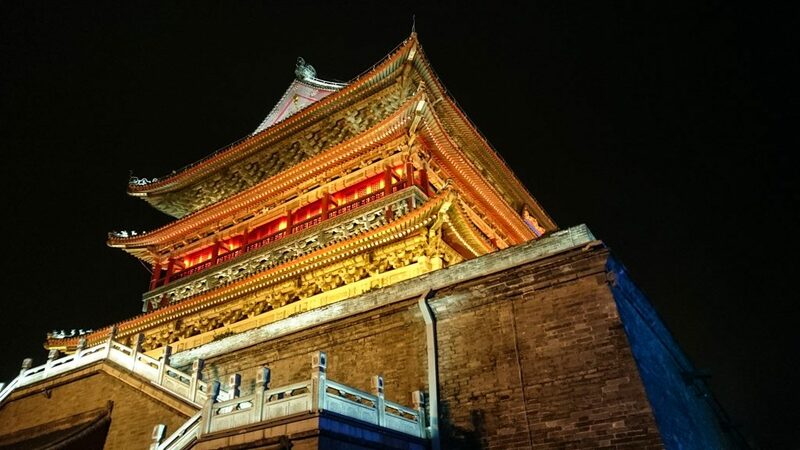 Plan your itinerary and don’t forget to add to it these 10 amazing things to do in Xi’an, I’m sure you gonna love the city! This is so similar to the itinerary I recently had as I traveled through Shaanxi province. Xi’an is just amazing, and the Muslim Quarter really was amazing (especially while I was a bit lost with friends). 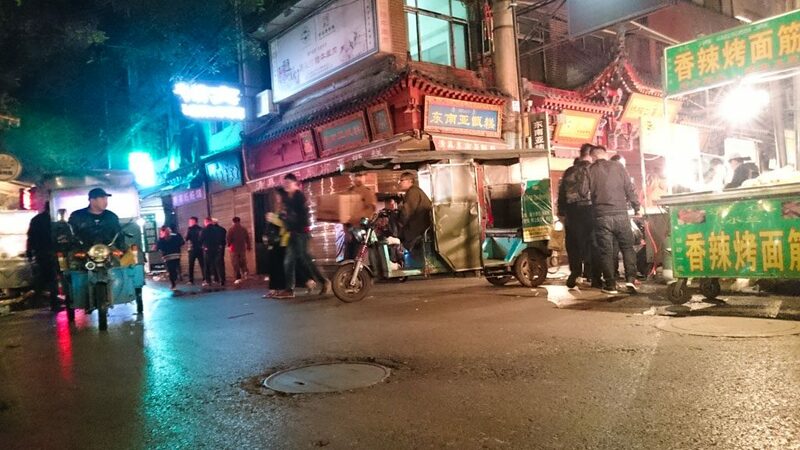 Agree, Xi’an is amazing, and the Muslim quarter a delicious place to get lost! Its good to see that you’re adventurous, but not crazy. It seems like climbing the ‘most dangerous hike’ path was worth it, rather than risking it further to do the climbing part. I visited China on a school trip as a 16 year old and it certainly opened up my eyes! China is a different world and travelling there definitely opened up my eyes too. Wow, the climb looks and sounds kinda amazing in a scary way. I am surprised they still allowed you to climb at all in the rain and cloud like that. Not sure I would have been brave enough to do even what you did. I have heard the food is reason enough to visit tho. Thats why its on my list. The climb was worth it, eve with such bad weather, the nature in Huashan Mountain is stunning. If you are a foodie, definitely you will love Xi’an! A few years ago the terracotta army was on tour and we got to see part of them in Rome. I’d love to see them in China! I am worried that some of the Chinese behaviors like spitting will make me lose my patience, so thanks for addressing that. There are things that will definitely be a culture shock when I visit. To be honest, I was prepared for a stronger cultural shock, but surprisingly Xi’an was easy to explore, and only in a few moments I felt really out of my comfort zone. It’s a different culture, we need to open our mind for it, and at the end we learn a lot. This is somewhere I really want to visit! After learning Xian was where the Terracotta Soldiers are, this place has been on my list for a while! Nice to know there’s more to do besides this as well! 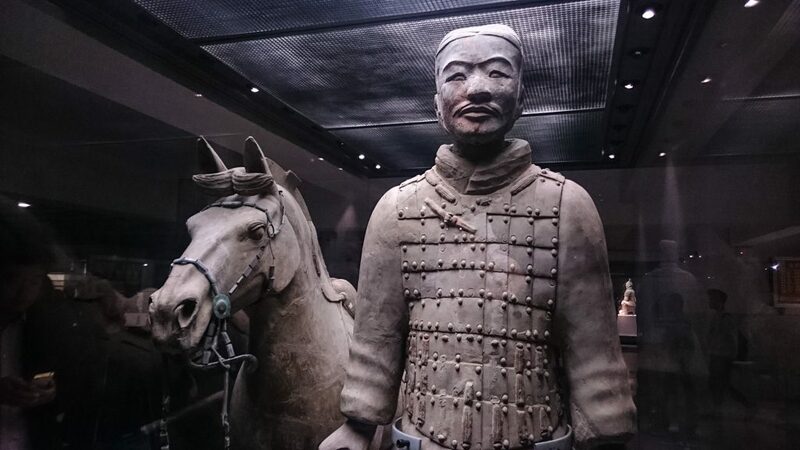 Xi’an has plenty of interesting places to visit and see, most of the tourist go there only for the terracotta Warriors, but I do recommend to stay a bit longer and get to know this ancient and interesting city. Xi’an is a really interesting travel destination. If you have the chance to travel to China, you definitely should put Xi’an n your itinerary! 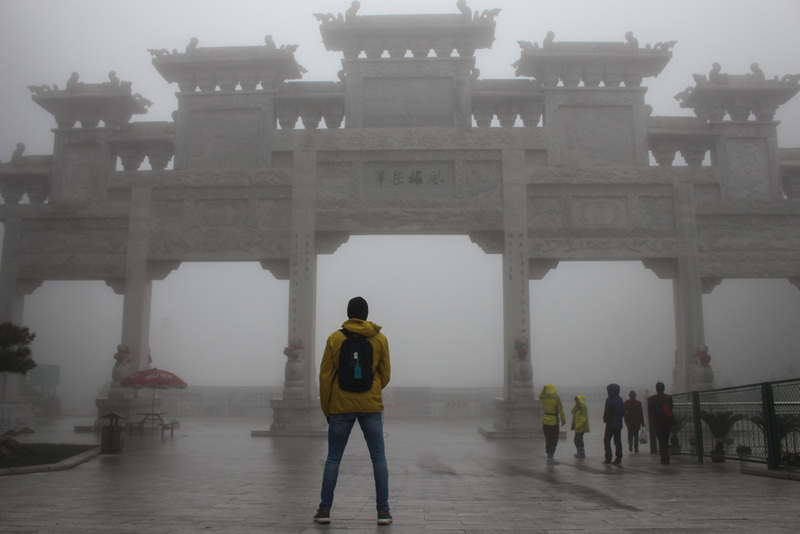 I spent a month in China and didn’t love it. However, one of my regrets is not getting to Xi’an and seeing the Terracotta Warriors. I think of this list, other than the warriors is the calligraphy. It’s just so beautiful, and I’d love to now more about the art. A month in China is a lot of time, I’m not surprised you didn’t enjoy too much. I’m not sure if I would be able to do it, it’s a long period in a very different culture. 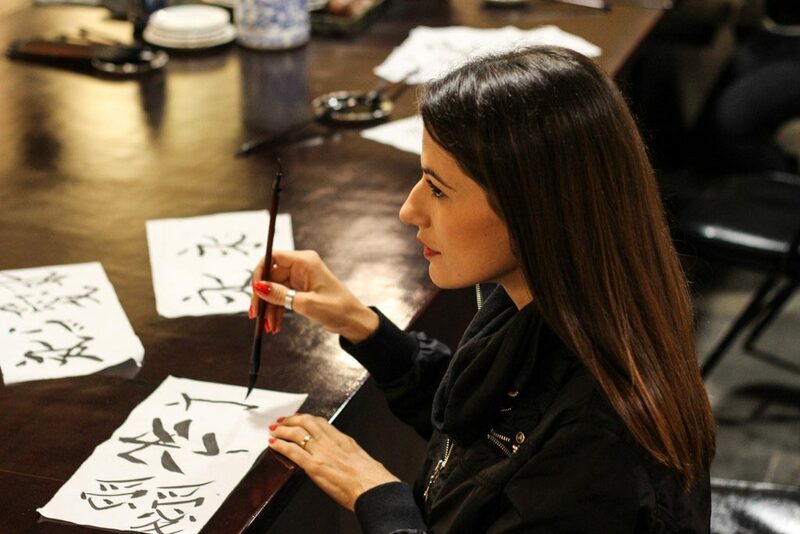 And you are right, the Chinese calligraphy is amazing! I’ve been wanting to go to Xi’an I feel like it has a lot of history. I bet I will love it. How many days will I need to do all these? We stayed in Xi’an 4 days, time enough to visit all the attractions and places. I’m sure you gonna enjoy the city a lot! I’d love to visit the terracotta army some day, and it’s good to know that there’s lots of vegetarian food to choose from. The vegetarian options were a big surprise for me, I was afraid to not eat well n Xiãn as I’m not a meat eater. But surprising we found delicious and vegetarian food there. The Terracotta army is impressive! If you come back to Asia, put Xiãn on your travel itinerary is worth a visit! We just left Chiang Mai, we are in Bangkok now, enjoying the last days in Thailand. We put China on our Asia itinerary on the last minute and was worth it! Hope to see you in Europe! We are in the planning stage for our trip to China in June, so this post was a great find and useful resource for us. So glad to hear that! We didn’t travel much in China, only Xi’an. And this city is worth the visit for sure! You gonna love it! What time of year did you visit Xi’an? We are going to China in July but our trip doesn’t include it so we plan on returning next year as we are doing a ’round the world’ including Tibet and we discovered we can get the train from there so we plan on staying a few days. Tks for the kind words Liz! Thanks for the excellent travel log Natalie and Robson. I have actually been twice to Xi’an and the second time January 2018 I spent the month in China including 4 days in Chengdu Sichuan and a week in Xixuangbanna which is in the south of Yunnan province bordering Laos and Myanmar where the Mekong River flows and they have wild elephants. I actually clicked on your page to see what that first picture was. I am wildly guessing it is near the Dao temple south of Xian. The rain and fog made it a beautiful and mysterious picture. I am wondering where the Bhuda restaurant is. It sounds like a tasty place to eat. We really want to go back to China for at least a month! If I’m not wrong here is the location of the restaurant. Great photos even when the weather was bad! What camera were you using by the way? Thanks! At the time I was with a Canon T5i with 18-55mm and 50mm lenses. Now I’ve switched to a Sony a6500 and I’m loving it! Super awesome write up. Im planning Xian on Oct last week. Mount Huashan and muslim street will be my prime importance, Thanks to you. If you dont mind please clarify few of my doubts. Which month u visited? How is the local transport (Gmap showing, to travel 5KM in bus, it will take 1Hr…Is it?)? Do they speak English? How is the restaurants? are they costly? Restaurants and street food were affordable. Nice post. 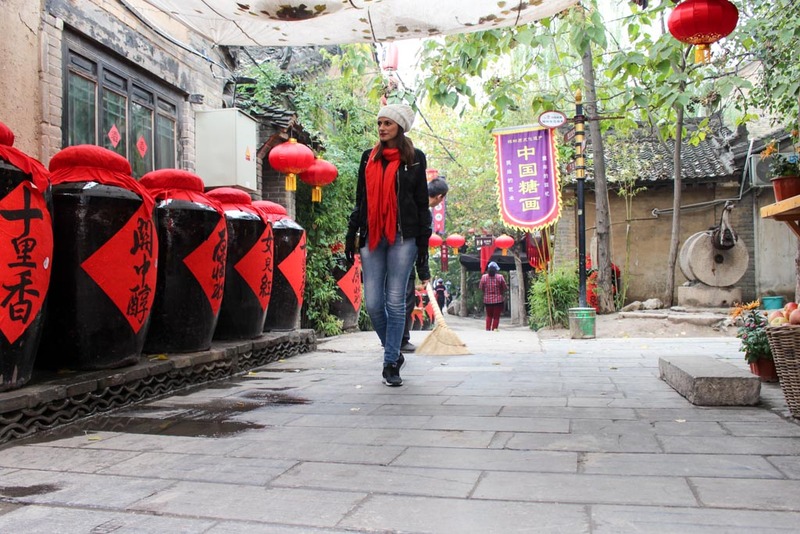 I’m interested in doing at least one non-touristic visit in Xian, and I think I’ve found it through your post — Yujian village. I’d like to know how to get there. Thanks for any additional info! Natalie, where is the gate from your main image? I have been googling it but cannot find a similar one in Xian. Hi! Great post. When did you go to Xian? I am concerned about the weather and would like to walk the wooden plank. I am planning to go late March. We were there in late October and it was quite cold! Hi! I am traveling to Xian next week. Was wondering whether Yuanjia Village is not too touristy? I mean you get mobbed into buying souvenirs/high pressuring? What is the best time to go there, and how long is it worth spending time there based on your experience. Thanks for sharing…love your spirit of sharing and paying it forward for others! The Yuanjia Village is a touristic place, but we didn’t feel the pressure to buy souvenirs either to eat at the restaurants or cafes. It was a very relaxing and pleasant walk through the village. I believe we spend almost 2 hours there, we had some snacks and endless photo opportunities. We visited in the middle of the afternoon and if I’m not wrong we left around 5 pm. Wishing you an awesome trip!